Now we are treated to Tom Holland’s first full outing as Spider-Man in Spider-Man: Homecoming. And it is an amazing blast. Spider-Man: Homecoming continues Spider-Man’s story following the events of Captain America: Civil War. Peter Parker dons the same suit he had in Civil War to become the friendly neighborhood Spider-Man in his own neighborhood. Peter Parker encounters Adrian Toomes/The Vulture (Played by Michael Keaton who once played Batman). He and his team are equipped with weapons fashioned from alien technology. That weaponry is dangerous. More dangerous than our friendly Spider-Man should be facing on his own. When he challenges The Vulture and his men, Iron Man has to intervene and save the day. Peter Parker’s behavior causes Tony Stark (Robert Downey Jr.) to reclaim the Spider-Man suit he had gifted Peter. With all of the action, humor, and adventure of Spider-Man: Homecoming, you might think there aren’t leadership lessons in Spider-Man: Homecoming. You’d be wrong. 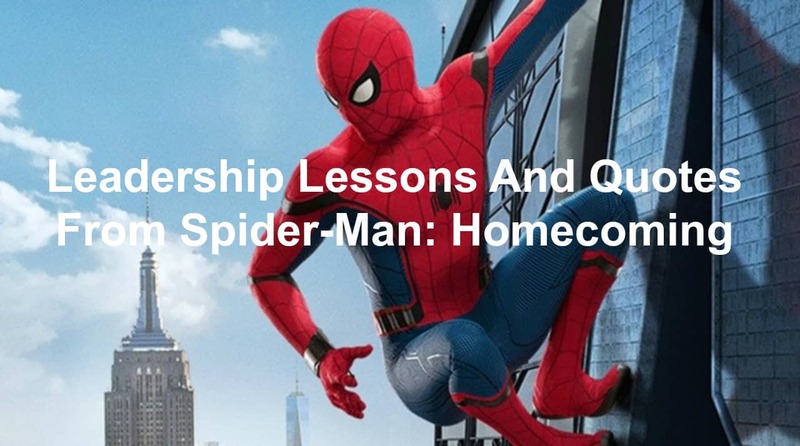 Let’s dive into the leadership lessons from Spider-Man: Homecoming and what we can learn from this latest adventure into the Marvel Cinematic Universe. CAUTION: Spider-Man: Homecoming spoilers below. Things are never going to be the same again. When we first meet Adrian Toomes, he’s running a salvage crew cleaning up the mess left by the Avengers. There’s alien tech all around him. He knows this is game-changing. Toomes had a good thing going. He was cleaning up the damage left after the super-hero battles. He was able to claim what he wanted and throw out the rest. But then something happened. A new group called Damage Control came into the picture. They were brought in swiftly and replaced Toomes’ salvage team. All without warning. Someone else will swoop in and take over your leadership position. Many people saw the debris left over from the Avengers battle as junk. There was no use for it. Toomes salvage crew saw things differently. They saw a wealth of new technology that could be used to benefit themselves. And that’s exactly what they did. Something was different during the Marvel Studios intro. Instead of the animated sequence we’re accustomed to seeing, we are treated to live-action images of Marvel characters. Many leaders are afraid of change. There’s a thought that tweaking anything can damage their organization. Get over that line of thinking. Bring change into your organization. Being the fastest isn’t the best if you’re always wrong. Ms. Warren (played by Selenis Leyva) is one of Peter Parker’s teachers. In one scene, she asks a question of the class. Flash Thompson attempts to be the first to answer the question and gets it wrong. Peter Parker then answers correctly. Their teacher then slips out this epic quote from Spider-Man: Homecoming. Ms. Warren knows there’s a difference between being fast and being right. Often times being fast will preclude you from being right. The first time we see Peter Parker put on the Spider-Man suit, we see he lacks grace. He’s clumsy and stumbles around trying to put on the suit. Have you been there? Most leaders start out awkwardly. Beginning leaders are trying to get their bearings. They stumble and fall. They may even look goofy. If you’re not feeling comfortable in your role as a leader, that’s okay! You’re just beginning to lead. The more you practice leadership, the more comfortable you’ll feel. You’ll also find slipping into the leadership role gets easier and easier. Peter, as Spider-Man, was trying to stop petty crimes and help old ladies cross the street. Spider-Man came across a young man with a slim-jim trying to unlock a vehicle. He shoots out a blast of webbing and stops him. Except he learns he made a mistake. The young man wasn’t breaking into the vehicle. The vehicle belonged to him. Every great leader desires to do more. They want to have an impact that lasts in the world. While great leaders desire to do more, they are still willing to do the small things. Peter Parker never stopped helping the little person. He kept at it. Great leaders do the same. They continue to make sure the little things are getting done. When the little things are ignored, the big things begin to fail. Ned Leeds (played by Jacob Batalan) is Peter’s best friend. He’s also one of the only people who know Spider-Man’s true identity. When he discovers Peter Parker is Spider-Man, he begins with a barrage of questions. He wants to know everything. He’s hungry to find out more. The Aunt May Parker we know and love is gone. She’s no longer an elderly woman. Instead, she’s replaced by a younger actress. Marissa Tomei plays Aunt May in Spider-Man: Homecoming. Spider-Man is not a party trick. Ned wanted Peter to swing into Liz Allen’s (played by Laura Harrier) party and introduce himself as a friend of Peter Parker and Ned’s. Peter protests and says his responsibility as Spider-Man isn’t to do party tricks. There are leaders out there who use their role as a leader to do party tricks. They spend money they or their organization don’t have to impress people they don’t care about. Or maybe they use their position as a leader to flout their power. There, Peter almosts drowns. Then his friend Iron Man shows up to save him (though we quickly learn this Iron Man is an android controlled by Tony Stark). Don’t be a leader who thinks they need to be a lone ranger. Leadership isn’t a solo journey. Peter and his classmates traveled to Washington D.C. to compete in an academic decathlon. Peter’s team won the decathlon without his presence. They then went to the Washington Monument for a tour. While there, the Vulture attacked the Washington Monument with Peter’s classmates in the elevator. Flash Thompson was in the elevator, holding the trophy from their decathlon win. Flash was able to escape but then asked for their trophy to be passed up to him. He HAD to have the trophy. He valued the trophy more than his friends and teachers. Flash was valuing the wrong things. Bad leaders get caught up in the wrong things. They begin to value the prestige and honor that comes with leadership. They forget what things they should value. What is it like to be famous and no one knows it’s you? You’re there to guide others, move the organization forward, and get things done. If you get the credit, great. If not, keep going. How are you going to make things right? The school system in Spider-Man: Homecoming used pre-recorded videos of Captain America to inspire the kids. When Peter Parker had to go to detention, he had to watch one of the Captain America propaganda videos. Earlier in Spider-Man: Homecoming, Spider-Man tried to apprehend the Vulture’s henchmen during a weapons deal. The henchmen were trying to sell the weapons to a low-level street thug. Later in Spider-Man: Homecoming, we learn Spider-Man’s actions gained the respect of the thug. The thug respected the fact Spider-Man was willing to take a shot meant for someone else. Because of the respect Spider-Man had gained with the street thug, the thug gave up the location of the Vulture and his men’s next deal. This led Spider-Man to the Statton Island Ferry. There, a major battle ensued. The Shocker was knocked over the side of the ferry and holding on for dear life. The Vulture then knocks him off trying to kill Spider-Man. He had no regards for the safety or lives of the men working for him. Bad leaders don’t care about those they lead. They only see dollar signs and what’s in it for them. Great leaders, on the other hand, put their people first. They care for them and their families. But he was the only one believing in Peter Parker/Spider-Man. No one else had faith in him. I wanted to be like you. Tony Stark was a mentor to Peter Parker. He believed in him and championed his rise. Peter wanted to be like Tony. He saw a wealthy, successful man and wanted to emulate him. Last week the decathlon was the most important thing. Then I almost died. Then she almost died. And she realized her focus was on the wrong thing. Adrian Toomes had a chat with Peter Parker after he dropped his daughter Liz (Peter’s homecoming date) off at the school. He gave Peter reasons for his actions. The rich are getting richer. The little guy can’t make it. And other rationalizations. That’s what bad leaders do. They rationalize their bad actions. They blame others and deflect their own responsibilities. If you find yourself rationalizing your actions, look long and hard at whether or not you’re doing the right thing. Tony Stark took back the advanced Spider-Man costume. Peter Parker had to fight the Vulture in his homemade, pajama Spider-Man suit. Peter wasn’t sure if he could win the battle. The Vulture brings down a building on Spider-Man. It looks like he’s finished. Then Spider-Man realizes he’s more than the suit. That’s when he lifts the debris off of him and continues his pursuit of the Vulture. You are more than that and you can lead without the title. Somebody’s gotta look after the little guy. At the end of Spider-Man: Homecoming, we see Peter Parker’s growth. He begins to realize being a superhero isn’t about doing big things. Being a hero is about helping the little guy. Peter longed to be an official member of the Avengers. It was his dream. When Tony Stark finally offers him a place on the Avengers, Peter does something no one expected him to do. Peter Parker turned down a membership to the Avengers. Your decision to take a promotion or not is up to you. Make a wise choice. Sony Pictures has created three different Spider-Man universes. The first was Tobey Maguire as Spider-Man. Then came Andrew Garfield as Spider-Man. We’d already been given Spider-Man’s origin story with Tobey. Sony felt the need to rehash Spider-Man’s origins when Andrew Garfield took over. With Spider-Man: Homecoming, Sony gave us something new. There was no rehashing the origin story of how Peter Parker became Spider-Man. Instead, they jumped right into the story. Sony moved on from the origins. And it worked well. Find new stories to tell. If you don’t have new stories, go make a new story. Question: Have you seen Spider-Man: Homecoming? If you have, did you take away any leadership lessons from Spider-Man: Homecoming? If you haven’t seen Spider-Man: Homecoming, share your favorite leadership lesson from Spider-Man: Homecoming that I shared. Let me know yours in the comment section below.